An extra-smooth smoke with uncompromising richness, the Romeo y Julieta Reserva Real's flawless Connecticut Shade wrapper, Nicaraguan binder, and blend of Dominican and Nicaraguan long fillers culminate in a flavorful and aromatic smoke with pronounced notes of smoky cedar, leather, and spice. The convenient 4x33 Minutos Petites size allows you to enjoy the fine flavor of Reserva Real wherever the day may take you, even when you’re short on time. Very good cigar for a short smoke. I am always on the go and don't have time for a regular size cigar.The Reserva Real Petites give me the same great taste in a quick and easy package.Would highly recommend for anybody on the go. Nice, tasty 20 minute smoke. Very satisfied. These are great tasting and fantastic quality. Perfect for any situation. A fairly good, quick smoke. Occasional wrapper unwinding as well as tough draws hinder what could be a glowing review. 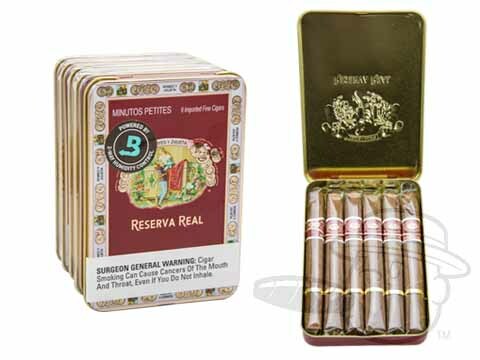 Romeo Y Julieta Reserva Real Minutos Petites is rated 4.6 out of 5 based on 10 customer ratings.